The most beautiful gifts of nature in the world, crafted by Germany’s best artisans: into the universe’s most impressive jewellery. 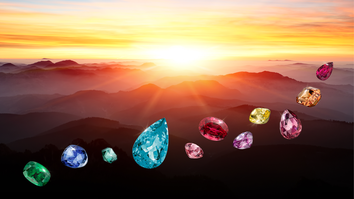 Paul Wild offers all classical coloured gemstones like ruby, sapphire and emerald. And also rarities as Paraiba tourmaline, tsavorite, tanzanite, spinel, demantoid, Mandarin garnet, alexandrite and others. Many of these high-value, high-carat gemstones come from Paul Wild’s own mines. Paul Wild stones are cut and finished exclusively in-house. This long-established company offers all classical cuts and continuously develops novelties like new set designs or a special gemstone cut. Oscillate in brillant colours - Paraiba Tourmalines from Brazil and Mocambique. A Trend is a great opportunity for the company to demonstrate its skills in fashion to tradition, and topicality to consummate craftsmanship. Sets. All kinds. Your choice. “The end customers expect unique pieces of jewellery. Unique stones are the raw material.” Unique gems are rare. Unique sets are even harder to find. Paul Wild stands for Sets. Whether facetted gems, engravings, cabochons or characters. Paul Wild is proud to present selected gemstones from the company‘s own mines: Paraiba tourmalines extracted in Brazil and Mozambique. The Star of the Rainbow. Demantoids from Namibia - sparkles more than diamonds.